Catheter-associated urinary-tract infections in hospitalized patients are considered “never events”—they should never happen. When they do, the hospital is penalized by Medicare and third-party payers. The issue can really burn a hospital. Naturally, hospitals are very interested in ways to avoid UTIs. One hospital I worked at had tried several solutions, and some turned out to be bad choices. They tried taking catheters out of patients before those patients had a chance to develop an infection. That sounds like a good idea because, in general, removing a catheter as early as possible is a good thing, but it’s not good if it’s removed too early. That’s an important distinction that didn’t get made, and catheters were being removed too early for many patients. In critically ill patients, for instance, the catheter may be needed to follow the patient’s urine output carefully. Many ICU patients could not be monitored appropriately once their catheters were removed too early. The hospital also tried out perhaps the worst possible solution, which was just not sending samples for urinalysis so they wouldn’t have to make the diagnosis. Obviously, that’s something we don’t want for patients. If a patient gets an infection, we want to know about it and treat it. At this hospital, when patients did get a urinary tract infection, it was recognized much later. So what can be done? What does a good solution to a healthcare system problem look like? In its attempt to solve a problem, the hospital chose bad solutions that, in some cases, actually made patients sicker. Bad solutions often have a certain look about them: they’re solutions that are difficult to implement, are expensive, are otherwise prohibitive, take multiple steps to get done, don’t work or just generally make things worse. If a patient comes to the hospital with an existing UTI, then the hospital isn’t generally responsible for it as a hospital-acquired UTI that the patient received in their institution, and therefore the hospital doesn’t get penalized. (Of course, the hospital is still responsible for diagnosing and treating the patient properly.) Obviously, the key is to test patients at admission, especially ones who are at high risk, to find out if they already have a catheter-associated UTI or that they’ve come in with a UTI even if no catheter is present on their arrival. The test is very quick, inexpensive, and easy. To make it a routine part of admissions across the hospital, however, isn’t always easy. At one hospital where I worked, the center had to decide what changes to make to its system to ensure that every patient, not just the obvious high-risk ones, was automatically tested for a UTI at admission. The solution was fairly obvious: allow nurses to obtain the test, via a standing order from physicians that included certain criteria regarding for who should receive the test and results. The urinalysis becomes part of a comprehensive outside hospital (jokingly nicknamed the “OSH” for “outside hospital”) workup for patients who come from other hospitals, nursing homes, rehab centers, or even retirement communities. These facilities are like “outside hospitals” because their patients are similar to transfers arriving from other hospitals “outside” the one we’re describing. This urinalysis test doesn’t hurt the patient at all, it’s very inexpensive, and there’s very little to no downside risk. 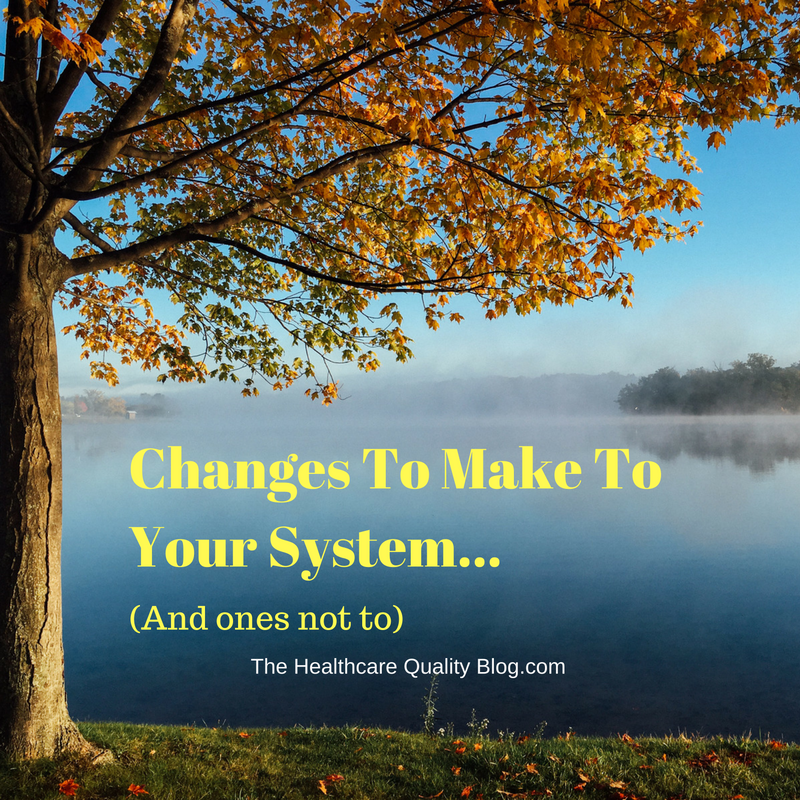 This small, simple change turns out to be a big help for the patient and the organization. The comprehensive approach catches not only UTIs but also other problems, such as deep venous thrombosis. That’s another condition that can penalize the hospital if the patient develops it during a stay, so it’s better to know if they’re coming in with it, both to prevent a penalty and to get treatment started right away. Deep venous thrombosis can kill a patient. Part of the OSH workup in the hospital where I worked included a test for deep venous thrombosis. A good solution is one that is easy to implement, straight- forward, and turns out to bolster other quality and safety issues. The best solution makes it easier to do the right thing. In the case of catheter-associated UTIs and deep venous thromboses, the hospital set up standing orders from a physician that empowered ER nurses to order the tests. With the DMAIC process—define, measure, analyze, improve, control—you’ll often end up with several can- didate solutions. How do you filter through the changes that you want to make and the guiding principles to come up with the best solution? In the case of catheter-related UTIs, you’d want to find a way early in the process to identify patients who arrive with one. You’d want to define what you’re measuring. It’s very important to align the measurement with the intervention, and vice versa. Are you looking at the percentage of patients who have a urinary-tract infection? Are you looking at reducing the number of hospitalized patients who have one, measured monthly? The endpoint measurement really matters here, because when you implement the program, you may well see an increased rate of urinary-tract infection in hospitalized patients. That’s because now you’re looking for them, so you’re finding them. But on the other hand, with your new program in place, the rate of hospital-acquired catheter-associated urinary-tract infections should be lower. That leads to a further measurable endpoint: savings from not being penalized by the cost of poor quality. Part of your UTI rate project may include a SIPOC diagram. Many patients come to the emergency room with catheter-associated infections that they got in their nursing home, or a pre-existing urinary tract infection / colonization even if no catheter is present at that time. So, you can look at nursing homes as suppliers who send you patients. One way to reduce the number of patients coming in with UTIs would be to do outreach to the nursing homes to help them manage catheters better and be more aware of the symptoms of an infection. Or you could do outreach only to the nursing homes that send you the most patients with infections. You could make sure that attending physicians who round on nursing homes are sensitized to the problem. But you also have to be aware of the scope of your project and realize that you can’t always influence the people who send you patients. Solutions that work are realistic and within the criteria the team selects. Most solutions to quality problems in medicine end up creating more paperwork. I rarely see solutions that involve less paperwork. Based on my experience, I estimate that at least 80 percent of the solutions that come out of healthcare improvement projects typically involve more paperwork—another form to fill out, another item on the chart, another checklist. Now, let me be clear: I do like checklists. They’re useful and have a place in quality improvement. But they’re only one part of a vast arsenal of what you can do to improve a system. Although checklists are a buzzword and hot topic now, a checklist isn’t always the best, most implementable, or most effective solution. It often just creates more paperwork. Checklists can be a good starting point, but they’re often not the most effective solution in the set of all possible solutions. (They are, however, infinitely better than nothing!) Physicians today often spend about half of their working day on paperwork. A checklist that only adds to the load often isn’t really helping. For residents, the paperwork is even worse. A lot of it just gets dumped on them, and they end up doing mindless clerical work that doesn’t necessarily improve quality. How much of an impact does this have? We don’t know, because we don’t rigorously measure that sort of work. We often don’t really know if it makes any difference to quality. We often don’t know if we’re doing better or worse for having added twenty minutes of paperwork. I advise us all to look to a wider array of interventions than just checklists. When a system is error-proofed, it’s a lot easier for every- one to do the right thing every time and a lot harder to make a mistake. This is the Japanese design philosophy of poka-yoke (pronounced “poke a yoke”), also known as error-proofing, mistake-proofing, or sometimes (rarely) idiot-proofing. The idea is to set up a system that’s as immune to human error as possible. Many mistakes are inadvertent; poka-yoke helps avoid them. In manufacturing processes, where the idea was first developed, poka-yoke is used to prevent mistakes before or while they’re being made. The idea is to eliminate defects at the source. For example, on an assembly line, a poka-yoke solution to putting a part in backward might be to redesign it so that it can only fit when it’s in the proper position, or to color it on one side so that you can see immediately if it’s in place correctly. If a part requires the worker to install five screws, provide the screws in packages of five so that forgetting one or using the wrong screw becomes almost impossible. In healthcare, where we’re dealing with humans in fluid situations that require experience and judgment, poka-yoke changes aren’t generally as straightforward as retooling a part. For example, although we commonly use kits that contain everything needed for a procedure such as inserting a central line, often the procedure doesn’t require everything in the kit, leaving plenty of room for human error. In medicine, we have to make it easier to do the right thing even when the right thing is complex and the people who need to do it are very busy and have a lot of distractions. Under these circumstances, poka-yoke solutions almost always mean making something harder, either mechanically, physically, mentally, structurally, or by creating more paperwork. This sounds counterproductive and more like punishment than help, but in fact, by making it harder to deviate from a process or protocol, the system makes it harder to mess up. Great healthcare poka-yoke solutions are ones that eliminate or reduce the ability to make a mistake and eliminate some piece of paperwork! Some poka-yoke solutions are very simple, such as pop-up messages on a computer screen or making a form easier to fill in correctly (and quickly) by highlighting where the information needs to go. A good example of a simple poka-yoke solution for hand cleanliness is putting hand-sanitizer dispensers outside every doorway. If you have to look around for a dispenser, you might skip sanitizing; if a dispenser is right in front of you everywhere you turn, you’ll probably use it. Curious to read more about examples of solutions that work in healthcare quality improvement initiatives? Read more in Volume To Value here.